I have always been intrigued by the titles of Broadway plays. How many times have you attended a show, and by the time you left the theatre, were still trying to figure out what the title had to do with the play? This was my thought when I first heard of The Drowsy Chaperone, May River Theatre’s sixteenth season opening show. Drowsy, the winner of five Tony Awards and seven Drama Desk awards, has all the elements of a hilarious musical farce. It is a play within a play, crammed full of every cliché, gag and gimmick from the golden age of musicals. The idea for the play was originally hatched when several friends created a spoof of old musicals for a party in honor of Bob Martin, one of the show’s writers, and a friend, Janet Van De Graff. Don McKellar also collaborated on the writing and the music; lyrics are by Lisa Lambert and Greg Morrison. “I was introduced to Drowsy in college, cast as Underling, the stoic, yet faithful butler. I didn’t know that such a show existed within the annals of theatre. It openly poked and jabbed at both the art form and the experiences of musical theatre. May River’s cast includes Michael Weaver, Man in the Chair; Mimi Molina, Drowsy; Jean White, Janet Van De Graff; Danny Bittick, Robert Martin; Stephan Brannan, George; Steve Mason, Feldzig; Catie Anne Mengel, Kitty; Andy Wallington, Underling; Gail Westerfield, Mrs. Tottendale; Saundra Woods, Trix; and Robert Ryan, superintendent. Jonathan Boulon and Christian Osbourne are the gangsters, and the ensemble includes Lindsey Brannan, Corrie Frohnapfel, Matthew Davey and Xavier Jackson. The Drowsy Chaperone opens April 21 and will run through May 7, Friday and Saturday evenings at 8 p.m. with Sunday matinees at 3 p.m. at the Ulmer Auditorium at Bluffton Town Hall. 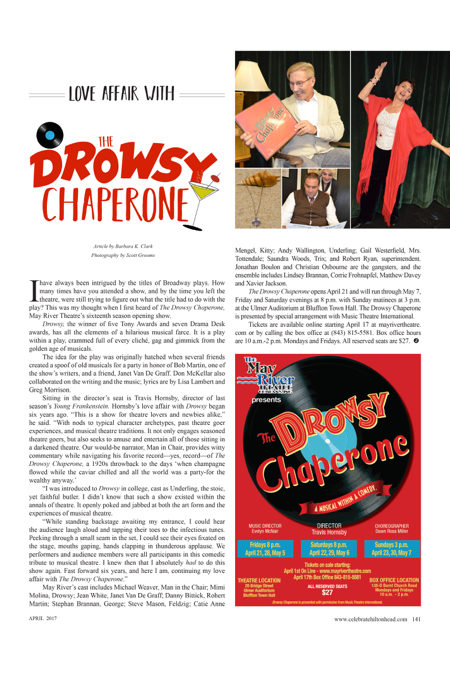 The Drowsy Chaperone is presented by special arrangement with Music Theatre International.